Superior National Forest, part of the United States National Forest system, is located in the Arrowhead Region of the state of Minnesota between the Canada–United States border and the north shore of Lake Superior. The area is part of the greater Boundary Waters region along the border of Minnesota and the Canadian province of Ontario, a historic and important thoroughfare in the fur trading and exploring days of British North America. The Superior National Forest comprises over 3.9 million acres (6,100 mi² or 16,000 km²) of woods and waters. The majority of the forest is multiple-use, including both logging and recreational activities such as camping, boating, and fishing. It is the eighth most visited national forest in the nation. Slightly over a quarter of the forest is set aside as a wilderness reserve, the million-acre Boundary Waters Canoe Area, the most heavily used wilderness in the country. This reserve, visited by over 200,000 people per year, allows canoers to travel along interconnected lakes and rivers and over historic portages once used by the Native Americans and First Nations peoples, and later by European explorers and traders. Superior National Forest is headquartered in Duluth, which is approximately 150 miles from the Twin Cities of Minneapolis and St. Paul, but the forest actually begins about 50 miles (80 km) north of Duluth. The forest service office at Ely is the most centrally located station within the forest; Ely is about 240 miles (385 km) from the Twin Cities and 110 miles (175 km) from Duluth. The forest has over 445,000 acres (1,800 km²) of water, which include some two thousand lakes and rivers, more than 1,300 miles (2,100 km) of cold water streams, and 950 miles (1,530 km) of warm water streams. Many of the lakes are located in depressions formed by the erosion of tilted layers of bedded rock; these depressions were given their final form by glacial scouring during recent ice ages. The forest is located on part of the Canadian Shield. The area is on a low plateau that is part of the Superior Upland. High points include the Sawtooth Mountains, a range of hills along the shore of Lake Superior, the Misquah Hills including Eagle Mountain, the state's highest point, and other uplands along the Laurentian Divide separating the watershed of the Great Lakes and Atlantic Ocean from that of Hudson Bay and the Arctic Ocean. Despite the presence of dramatic cliffs and other local differences in elevation, the area is essentially flat, as it is part of an old peneplain eroded by weathering, water, and especially glaciers. The principal result of recent glaciation is not the deposition of glacial drift (unlike most of the rest of the state), but the remodeling of the landscape by the scraping away of softer surfaces down to bare hard rock. The land therefore is raw, with many outcroppings of ancient bedrock, overlain in places by thin layers of gravelly soil and, in the west, silts deposited by glacial Lake Agassiz. The forest contains both true boreal forest (taiga), and a mixed conifer-hardwood forest known as the North Woods, a transition province between the northern boreal forest and deciduous forests to the south. Conifers include several varieties of pine, fir, and spruce trees; principal deciduous species are mountain ash, maple, aspen, oak, and paper birch. 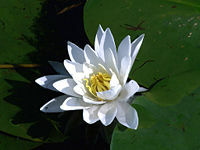 Characteristic aquatic plants include water lilies and wild rice. Fish species such as walleye, northern pike, smallmouth bass, several species of trout (lake, brook, rainbow, and brown) can be found in abundance in the forest's waters. Larger wildlife species include white-tailed deer, moose, Canadian lynx, American black bear, and the gray or timber wolf. 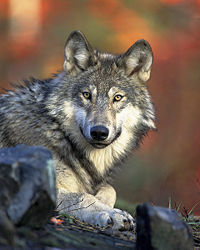 Northern Minnesota has the largest population of gray wolves in the lower 48 states, with approximately 300-400 wolves within the boundaries of the Superior National Forest. Located at the northern edge of the range of the hummingbird and near the southern edge of the range of the Canada jay, the forest has 163 nesting species of birds, the largest number of any national forest. Species include the bald eagle and other raptors, the ubiquitous common loon, and northern waterfowl. People have been living within the current boundaries of the Superior National Forest for more than 10,000 years, since shortly after the glacier retreated from the region, approximately 11,000 to 12,000 years ago. Archaeologically, the prehistory of northeastern Minnesota is subdivided into three cultural time periods: the Paleo Indian Period, the Archaic Period, and the Woodland Period. Throughout prehistory, the Assiniboine, the Eastern Sioux, the Cree, and the Ojibwe occupied portions of the Superior National Forest and adapted to the harsh winter climates and ecological zones. The Paleo Indian people entered this land in search of big game, but left few reminders behind. As the climate warmed, the forest offered a home to an abundance of plant and animal species, providing for increased exploitation of valuable resources by the Archaic people, who were characterized by adaptation to a changing ecosystem. Native copper was an important source of a wide variety of tools during this period. The Woodland Period was a time of great cultural and social diversity. Regional influences in pottery and arrowpoint styles took hold, and the variety of raw stone material used increased. The Woodland people lived in small groups, foraging over wide areas in a seasonal round of hunting and gathering. The early Woodland people were especially noted for the use of pottery, burial mounds, dugout canoes, and wild rice as a dietary staple. Later Woodland people adopted the bow and arrow and shifted to birch bark canoes. Initial contact between Europeans and Native Americans occurred with the French, who reached the west shore of Lake Superior during the mid-seventeenth century. The voyageurs of the fur-trade era traveled the water highway of the forest's current border with Canada in large canoes. Tribal groups existing at this time were: Dakota, Cree, Assiniboine, and Ojibwe. 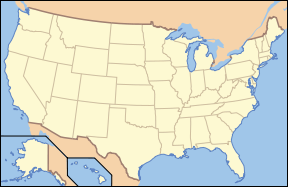 Other tribes in adjacent areas that took part in the contact and subsequent fur trade were the Ottawa, Monsoni, Potawatomi, Menominee, and the Fox. The Ojibwe provided animal pelts, winter food supplies, equipment such as canoes, and snowshoes; the French, in exchange, provided them with manufactured and specialty items, such as guns, cloth, clothing, copper kettles, tobacco, and many other products. After France was defeated in the Seven Years' War, which ended with the Treaty of Paris in 1763, three fur trade companies became prominent in the region: the North West Company, XY Company, and the Hudson's Bay Company. North West and Hudson's Bay merged in 1821. The British-American fur trade began after the War of 1812 and ended around 1870. For a time, both British and American posts were operating on the border lakes. In addition to the British companies, the American Fur Company and the Northern Lake Company were active. As the fur trade declined, fishing, mining, shipping, and lumbering assumed prominence in the region. The contact between American Indians and European fur traders led to both a reduction in the indigenous population and the drastic reorganization of the existing socio-political system. By the early nineteenth century, various bands of Ojibwe occupied areas within, and adjacent to, the current boundaries of the Superior National Forest. In 1854 and 1866, these bands ceded large tracts of land to the United States government in exchange for reservation allotments and the retention of off-reservation hunting and gathering rights. Attempts to assimilate Native Americans into the dominant socio-economic system followed in the late nineteenth century, with passage of the Dawes Act and the forced removal of children to boarding schools. Despite these attempts, the Ojibwe of northern Minnesota continued to exercise their autonomy by congregating both on and off reservations at traditional resource-gathering locations. Lake-side cliffs are common throughout the Boundary Waters Canoe Area. The industrial period of the late nineteenth and early twentieth centuries drastically changed the landscape, infrastructure, and economy of northern Minnesota. Within this changing world, some Ojibwe found opportunities for wage labor in the burgeoning mining, logging, and tourism industries. Ojibwe women found seasonal employment in the resorts and garnered extra wages by selling traditional foodstuffs such as wild rice, blueberries, and maple syrup to tourists. The twenty-first century finds the Bois Forte and Grand Portage Bands of Chippewa and the Fond du Lac Band of Lake Superior Chippewa actively engaged in the management and use of their ancestral lands. The first two participate in many cooperative projects through the 1854 Treaty Authority, an inter-tribal natural resource management agency that manages off-reservation hunting, fishing, and gathering rights within the treaty area. Currently, the Superior National Forest and 1854 Treaty Authority are working on species distribution studies of moose and lake sturgeon within the ceded territory. From 1869-1900, the building of railroads, mineral exploration (especially the discovery of iron ore), and lumbering attracted people to the area. While there was a rush of immigrants to settle on the land, many of the claims were fraudulent to acquire timbered lands for the big lumber companies or were soon abandoned by legitimate settlers due to poor farming conditions in northeastern Minnesota. Those who stayed were miners or loggers and their families. Pine timber logging began on the Superior National Forest in the 1890s and continued into the 1920s. The border lakes region presented numerous challenges to logging companies in accessing and harvesting timbered stands, which effectively left much of it untouched until the 1890s, when vast extents of the border lakes' forests had been stripped away in Michigan and Wisconsin. Early logging was accomplished by means of river driving. As timber near rivers became depleted, railroad logging became the primary method of getting the wood to the mill. Frozen ground conditions in the winter steered the logging industry to build ice roads, providing greater access to timber stands. Logging after 1929 focused more and more on pulp species and the wood products industry. Mining came early to northeastern Minnesota. By the 1870s, exploration parties were on the Vermilion Range. In 1882, Charlemagne Tower and Samuel Munson incorporated the Minnesota Iron Company. The town of Tower was soon formed and became the first mining town on the range. A railroad line was built from Two Harbors to Tower in 1884, connecting the iron range to Lake Superior's north shore. By 1888, mining had expanded to Ely, Minnesota. Early prospecting was also ongoing on the eastern side of the Forest. One of the best-known and shortest-lived was the Paulson Mine, which was located just west of Gunflint Lake. Exploration activities commenced around 1886 and, by 1892, a savvy group of investors had managed to connect the mine site by railroad to the city of Port Arthur in adjacent Ontario. The investors had hoped to connect the Port Arthur, Duluth and Western Railroad to the bustling port city of Duluth, Minnesota; however, these aspirations would never be realized. A nation-wide economic depression known as the Panic of 1893 led to the retraction of financing and to the collapse of the Paulson Mine enterprise in that year. The Port Arthur, Duluth and Western Railroad became financially irrelevant soon thereafter and was completely abandoned by 1914 after hauling only a single load of ore.
On February 13, 1909, Theodore Roosevelt signed a Presidential Proclamation officially creating the Superior National Forest. The original area was 644,114 acres, much of which was of cut-over and/or burned-over lands, "lands that nobody wanted." Today, the Forest has nearly quadrupled in size. Forest personnel work out of five ranger district offices, one work center, four guard stations, and the Supervisor's Office in Duluth. An increasingly mobile and affluent public in the first two decades of the twentieth century stimulated a nationwide call for recreation on Forest lands. Encouraged by the Forest Service, summer home groups and resorts began to populate forest lands under permit to the United States Forest Service. During the 1920s through the mid 1970s, the Boundary Waters Canoe Area was a remote, roadless area providing ample camping opportunities. Resort owners capitalized on this, providing motor boat and airplane access into remote forest areas to hunt and fish. In 1951, an airspace reservation was placed over the BWCA, effectively ending airplane service into these locations. The Civilian Conservation Corps, established to provide relief during the Great Depression, was tasked with numerous conservation projects on public lands. The accomplishments of the CCC are still visible in the Superior National Forest today in the form of pine plantations, administrative buildings, and miles of trails. 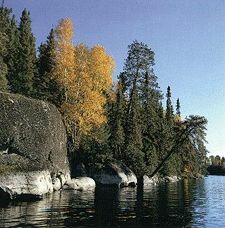 The national Wilderness Act was passed in 1964 with special provision regarding the Boundary Waters Canoe Area, allowing some motorized use and logging within the region's boundaries. Legislation approved in 1978 eliminated logging and snowmobiling, restricted mining, and allowed motorboats on one-quarter of the water area. In June 2008, legislation was introduced in the United States House of Representatives to sell 6,700 acres (27 km²) of land in the forest to a Canadian mining company that wanted to mine deposits of copper, nickel, platinum, and palladium. Proceeds from the sale would have been used to buy land more appropriate for Forest Service use. But the proposed sale generated cries of protests from environmental groups on the grounds that its exemption from an environmental review would set a bad precedent. In the end, the bill died without being sent to a committee. The Forest Service said it owned the surface land but not the mineral rights below the surface and was trying to avoid a legal battle. Critics say that copper mines in other areas of the world have almost always brought extreme environmental problems. Polymet is only one of several companies eyeing rich deposits of copper, nickel, platinum, and palladium under northern Minnesota's forests and lakes. The interest is being sparked by record-breaking prices for those minerals and new technology that makes it easier to separate copper from other rock. Salvage logging, road building, land trades, and off-highway vehicle use are the biggest threats to the Superior National Forest. In December 2008, the Superior National Forest issued a decision regarding use of its roads and trails by off-highway vehicles. As a result, the routes for such vehicles will increase by 285 miles and long-distance riding opportunities will increase by more than 300 miles. In order to connect existing trails at various locations, a total of 2.5 miles of new trail will be constructed. In addition, a total of 154 miles of unclassified road will be decommissioned. There will be very little overall change in the total miles currently available (1,600 miles) on the Forest for off-highway vehicle use. This is because existing roads and trails are being utilized to designate loop and long distance routes where riding opportunities previously were fragmented and not coordinated with other land managers. Consolidating OHV use is expected to, over the long run, result in lower road maintenance costs, cleaner water, improved wildlife and fish habitat, and fewer conflicts between motorized and non-motorized recreationists. ↑ 1.0 1.1 USDA Forest Service. Superior National Forest recreation Retrieved February 3, 2009. ↑ USDA Forest Service. 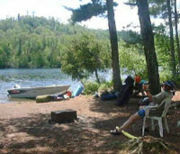 Superior National Forest: About Us Retrieved February 3, 2009. ↑ Guy E. Gibbon, Craig M. Johnson, and Elizabeth Hobbes, 2000, Minnesota's Environment and Native American Culture History Minnesota Department of Transportation. Retrieved February 3, 2009. ↑ Miron L. Heinselman, 1996, The Boundary Waters Wilderness ecosystem. (Minneapolis, Minn: University of Minnesota Press. ISBN 0816628041), 16-31. ↑ USDA Forest Service. Superior National Forest wildlife Retrieved February 3, 2009. U.S. Forest Service. Superior National Forest Retrieved February 3, 2009. U.S. Forest Service. Superior National Forest Heritage Program Retrieved February 3, 2009. History of "Superior National Forest"
This page was last modified on 28 October 2015, at 14:23.